I grew up in the suburbs surrounded by shopping malls, movie theaters, and restaurants galore. Several years ago, my hubby (a.k.a. Cowboy) and I , along with our burgeoning collection of critters, fulfilled our dreams and moved to the Texas hill country on 32 acres of raw land. From building our barndiminium to caring for our zoo to learning to drive a tractor, it’s one big farmtastic adventure. Rarely graceful, sometimes challenging, and always hilarious. So why a farm? Well to be honest if you had asked me in my earlier years, I would have declared you certifiable and invoked that lovely southern phrase known by farmgirls everywhere, “Bless your heart.” And there are days when we scratch our heads and question our choice, but Cowboy and I know this is where we are meant to be. So we scoop poop, fix fences, and watch sunsets. I started this blog focused to share the hilarity of farm life (and when you have a zoo, there are definitely plenty of chuckles to go around), but over time we’ve mixed it up with recipes, book reviews, and Lessons From the Farm. It’s my creative outlet and I hope you enjoy reading along. With a degree in English composition and language from the University of North Texas, it’s always been my dream to write, hopefully someday even pen a novel or a screen plan or a collection of short stories or who knows. The interwebs have given us more places for content than ever before (can I get a big yeehaw for that). In the meantime, I keep my creative juices flowing here on the farm and feel so grateful to share my farmtastic adventures. Feel free to drop us a line and tell us all about your farmtastic life. We’d love to hear from you. From our farmtastic life to yours, we wish you a big front porch, critters to love, and sweet tea moments! 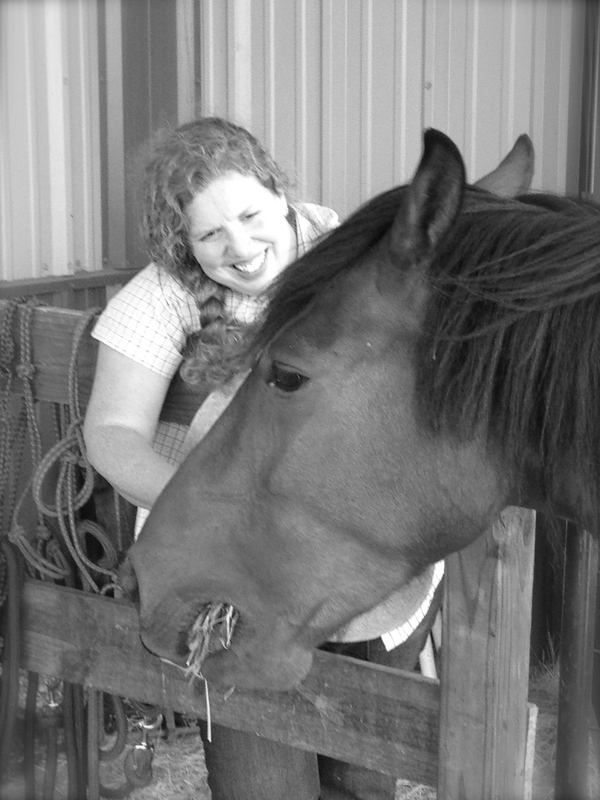 Spending a little time with one of our fur-kids, River, an American mustang.